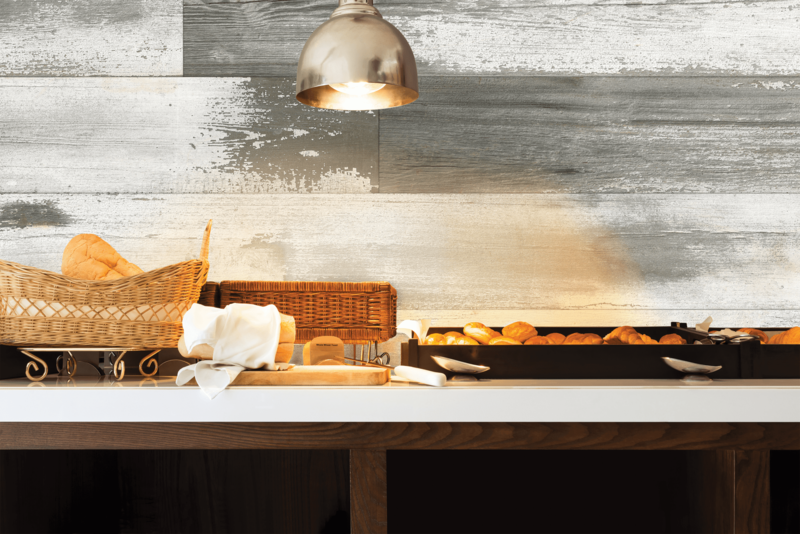 Panolam Surface Systems, a leading supplier of integrated surface solutions today introduced DUET™ Wall Panels, digitally printed wall protection panels that not only require a designed aesthetic, but also need to meet high sanitary standards such as moisture, mold, and mildew resistance. DUET Wall Panels are designed and tested for wall and ceiling applications in commercial facilities such as kitchens, restaurants, supermarkets, convenience stores, airports, department stores, sports facilities and complexes, and many others. The panels and their matching division bars, also come with a proprietary coating against fading from ultra-violet sources. Designed for ultimate flexibility, DUET Wall Panels are available in standard building product wall panel sizes such as 4’x8′ and 4’x10′. Files can also be printed in 8’x4′ format for use as wainscoting. DUET offers ten standard patterns than can be produced in any color, as well custom designs.